Bringing our war dollars home! With record unemployment, home foreclosures, and budget cuts to education, health and other life supporting services, CODEPINK launched a campaign to help local folks connect the dots between the financial crisis and a federal budget that dedicates 54% of our discretionary funds on military spending. We are working on city resolutions and with the US Conference of Mayors to redirect funds away from war and back into our communities. We also published our first cookbook, Peace Never Tasted So Sweet, with recipes for peace and pies from women around the world—available in our online store! Holding our leaders accountable for war crimes! All around the country, we've been hot on the trails of war criminals, countering their spin with calls for justice. As Karl Rove, Condi Rice, Tony Blair and George Bush have been peddling their whitewashed version of history; we've been at their speaking venues spreading the truth. We also disrupted Israel's PM Benjamin Netanyahu twice this year to bring the message that the construction of settlements and siege of Palestinian lands must end. We won't give up until the Justice Department does its job or we ‘cuff the criminals. As Obama announced the withdrawal of combat troops from Iraq (without mentioning the 50k remaining troops and 75k remaining private contractors) CODEPINK, Military Families Speak Out, Veterans for Peace, and Iraq Veterans Against the War put out an online statement, “Iraq Debacle”, which thousands signed onto. Our message was noted in the media and added an important, missing layer in the discussion of the Iraq troop withdrawal. 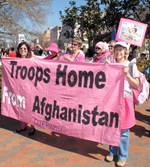 After more than 7 years of war in Iraq and Afghanistan, CODEPINKers are still in the streets, at rallies and vigils from Phoenix, Arizona to East Central Florida. Our Stolen Beauty boycott campaign against Ahava Cosmetics (settlement products) has now spread to the Czech Republic, South Africa, and Canada. Our allies in London and The Netherlands have persuaded local officials to launch investigations of the company's fraudulent labeling, and CODEPINK's Nancy K and Rae were invited to testify against Ahava at the Russell Tribunal on Palestine in London, which focused on corporations profiting from the Israeli occupation. In DC, CODEPINK also worked with the CENTS coalition to keep war profiteer Northrop Grumman from moving its HQ to the district! Defending the truth tellers and changing the game! The Wikileaks scandal was a game-changer in the media's (and public's) perception of the wars in Afghanistan and Iraq. We organized support rallies with Courage to Resist for PFC Bradley Manning at Quantico Base, Virginia and around the country. To us, he and Wikileaks founder Julian Assange deserve badges of honor, not threats of jail time. We also showed our support in Congress for the repeal of Don't Ask, Don't Tell with our usual pink flair. Transparency is critical in a democracy and we will continue to support the voices of those speaking truth to power. We closed down the Washington, DC Military Arms Fair on the mall this Mother's Day, followed by the permanent closure of the Army Experience Center in Northeast Philadelphia after an 18 month local campaign. 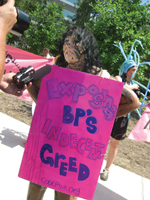 Only weeks later, CODEPINK cofounder and shrimper Diane Wilson, doused herself in oil (twice!) during BP CEO Tony Hayward's Congressional testimony. In 2011, we will be turning our attention to the U.S. Chamber of Commerce, the very Chamber that is destroying our democracy by dumping millions of undisclosed corporate funds into our elections. On March 8, International Women's Day, from Tucson to Bahrain, we joined with Women for Women International to march across bridges in solidarity with women survivors of war around the world. In May, we joined our sisters at National Domestic Worker Alliance, National Day Laborer Organizing Network, Tonatierra and Puente Arizona to participate in a fact-finding delegation to investigate the impact of the draconian law, SB 1070, on the women of Arizona. Cultivating vibrant communities and a healthy planet! At the United States Social Forum in Detroit, we did what many of us have dreamed of doing—we buried the Hummer. No longer being produced, the symbol of American hubris was transformed into public art (a giant flower pot) by activists from all over the world. Now it beautifies the environment instead of destroying it. We also joined with 350.org and Hands Across the Sand for days of action to counter our nation's deadly dependence on oil. Declaring (loudly and proudly) that war is insane! Jon Stewart of the Daily Show used CODEPINK as an example of how political discourse has been hijacked by the loudest—even comparing us to gun-toting Tea Partiers. 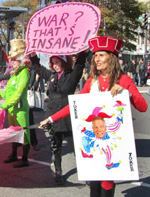 We pushed back, were invited on the show and brought our “War is Insane” message and our Mad Hatter's Tea Party to the Daily Show's Rally to Restore Sanity. A few weeks ago, we caught Rachel Maddow and Jon Stewart debating over our tactics, impact and the bigger issue of peace activism in our country! We will give them plenty more fodder in 2011! We'll also be taking new delegations to Gaza to break the siege; organizing a week of actions to counter AIPAC at its annual DC meeting; shining a light on havoc wreaked by the latest “weapon of choice,” (aka unmanned drones); pushing Secretary Clinton and the State Department to cancel its contracts with the mercenaries at Blackwater, and much more! To bring our campaigns to the masses and build a strong, viable base, we'll build on our success this year using the social media to spread our message! This year, we hit 25k on Facebook and grew by 4,000 members on Change.org just in the last 3 months. Our Youtube videos have had over 250,000 views this year. Our blog, PINKTank, got a makeovers, and are more versatile and user-friendly than ever. Look out for more videos, guest bloggers, live conversations with organizers, and more shareable web tools for every level of activist! From Fox, CNN and MSNBC to the Daily Show, Al Jazeera and Russia Today, from Business Week and the Wall Street Journal to Common Dreams, Alternet and the Huffington Post; from right-wing radio to NPR to community radio station CODEPINK's actions were broadcast far and wide. Our message reached millions—our collective voice for peace and justice getting louder and louder!